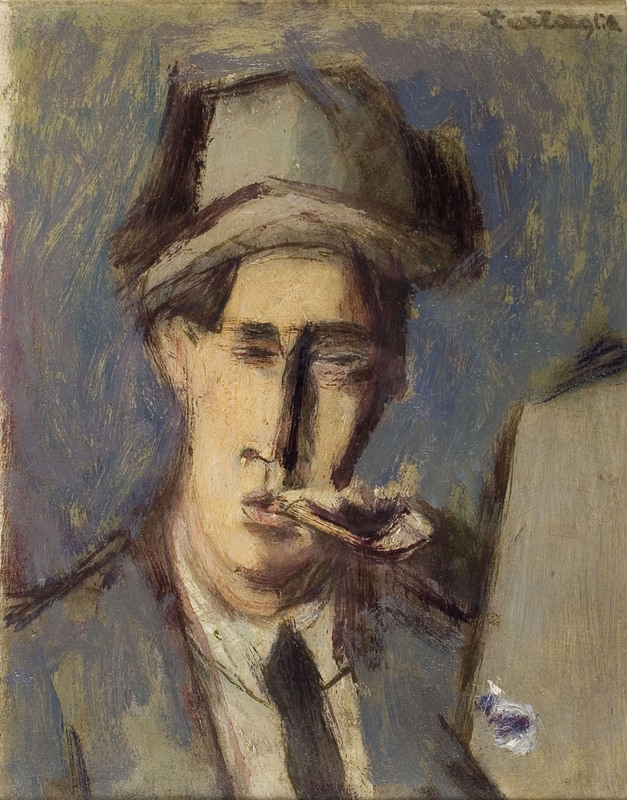 This painting is a new version of Tartaglia’s Self–portrait with Pipe from 1921. The original has been lost. In that work and in the painting Composition, from the same year, Tartaglia for the first time closely approached French painting. His pictures became more pastose, the division of light and dark areas much more complex, and the forms less geometric, suggesting an influence of Cézanne and agreement with the general artistic climate in Europe at that time. Marino Tartaglia. – Hewas born in Zagreb and received his first lessons in drawing from Virgil Menegel Dinčić, but his paragon was Emanuel Vidović At an early stage he was attracted by the works of Klimt and Anglade. He went to Italy and in Florence was drawn to the magnetic field of futurism. He became friends with Pappioni, Soffici, Palazzeschi. 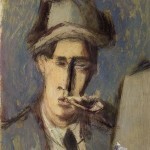 In Rome he joined Casa d’arte Bragaglia, which was at that time the focal point of arts, and later he was introduced to the circle around Galleria del Epoca. In 1921he travelled to Vienna where he stayed until 1924. He continued to improve his skills in Paris from 1927 to 1928. In 1931 he was back in Zagreb where he started teaching at the Academy. Tartaglia was one of the founders of the group Oblik(Form). He was a member of the Yugoslav Academy of Sciences and Arts from 1947 and in 1966 he also became a member of the Serbian Academy of Sciences and Arts. His works were recognised by a number of important awards.